On September 16th only: the owners family and their guides will be dressed up in 18th century costumes! Do not miss them! NEW ON 2016 : RESTORATION OF THE "PORTRAITS GALLERY"
After the renovation of its facade, the castle of Champchevrier has the pleasure to be able to share to the visitors with its room of the Portraits which regained its former glory. The woodwork were completely restored and you can rediscover their decoration set in the “Compagnie des Indes” style. Discover from now on in this room "The French Lifestyle", synonym for quality, for refinement and élégance. Qui veut " LAPIN " prend les moyens! 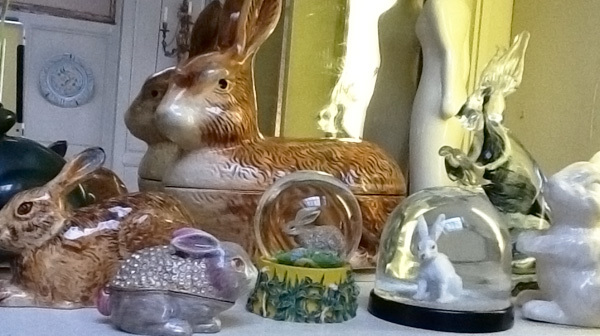 More than 250 rabbit items "breed like rabbits" in the portrait room. Coming from different parts of the world, they are displayed in two large windows. They are all one of a kind.